Posted Friday, June 18th, 2010 by Greg Gladman. If you are using an inkjet printer and you have started noticing a decline in print quality, it is possible you have clogged printheads. There are a few types of printheads, so be sure you refer to your printer manual if you do not know which type your machine uses. Once you have an idea, you can try a few different methods to clean the printheads and get back to better print quality. We have also included a video for a clear demonstration of the manual cleaning process. Typically printers that are only used occasionally are more likely to encounter a clogging issue. Because inkjet printers use liquid ink, when the machine isn’t used for a while, the ink can dry and clog. Once there is a blockage of dried ink, the number of ink dots ejected through the nozzles and applied to the page will drop, reducing overall quality. Even if you used your inkjet printer every single day, if you have stored a replacement ink cartridge for too long or in a less than desirable location, the ink may already be dried when you install it. Ink cartridges do have a somewhat short shelf life. Most machines offer an internal cleaning option, which is a fairly simple process. 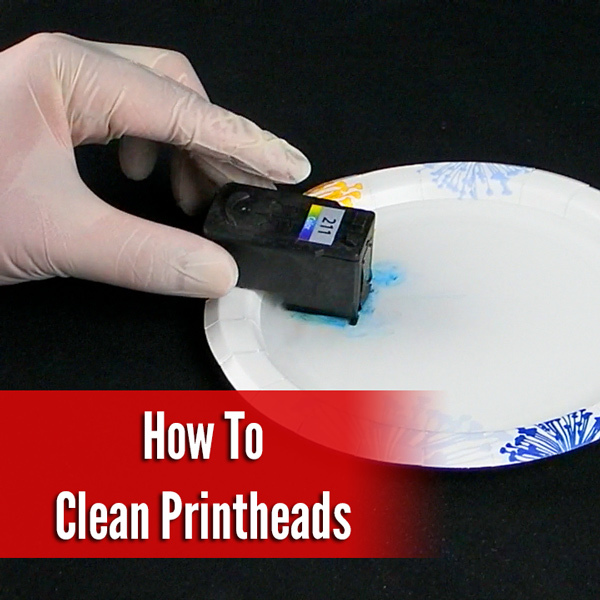 The printhead is heated and uses small blasts of ink to clear the clog. If this doesn’t work, repeat it just a few times, but not too many as you will end up wasting a lot of your ink. Select your machine, and right-click it. Select the tab that says Cleaning, Maintenance, or Service and look for the Printhead Cleaning process. If running the internal self-cleaner doesn’t fix the problem, you can try unclogging the printhead manually. Here is where it is necessary to know what type of printhead your machine uses. First you will need to remove the cartridges, then remove the printhead assembly then mix some water and isopropyl alcohol in a 50/50 mixture. You can either use a cotton swab to rub the water and alcohol on the printhead or you can soak the inkjet printhead for around 2 to 5 minutes. This should loosen the dried ink. It may take a few attempts and requires patience. Dry it on a folded paper towel and reinstall it. Print a test page to check quality. If the documents are still printing with poor quality, repeat and soak the printheads for longer. Remove the cartridge and soak it in the 50/50 water and alcohol mixture as above. Dab it dry on a folded paper towel, reinstall it once it is dry, then print a test page. If you are still getting poor results, soak the printhead assembly for a bit longer. If you have tried everything and you are still have quality issues, you may be due for a new cartridge, new printhead, or even a new printer.